I can't remember the exact day when I started incorporating more natural alternatives into our lifestyle, but I know it was sometime after my son was born in 2004. After his birth, I began to realize that perhaps the majority of "health" foods, and advertised "health" foods, are not everything they claim to be. You can read more about that story here. 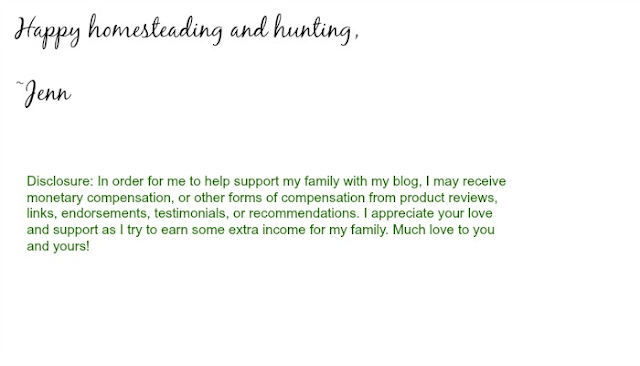 I began taking this a step further when moving to Kentucky and I started to dream about owning a homestead where we could hunt and raise our own meat, and where I could grow a big enough garden to supply our vegetables and fruits throughout the entire year. Oh, and I needed chickens! A girl has got to have chickens, and if all the stars align right, mine will be coming this spring! Once we made this dream into a reality, my list was, and still is, a mile long of things I want to accomplish around here. An area that I have invested the most time and money into is for kitchen appliances that help me make food from scratch quicker and easier for my family. 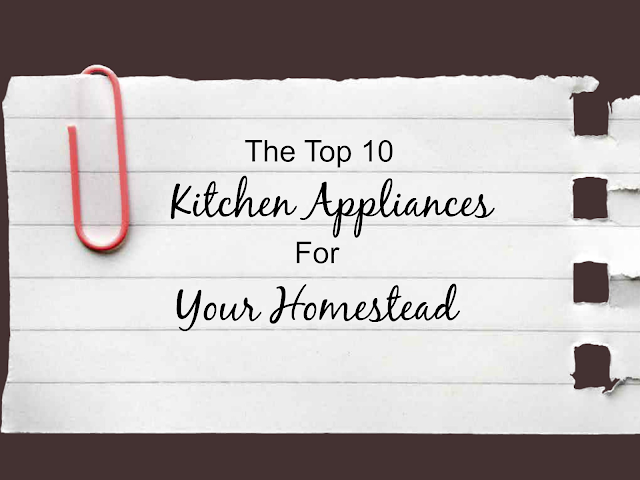 I have taken the time to list out the top appliances, in my opinion, that you need to have in your homesteading kitchen. Some of these I own and some are on my list to purchase as soon as finances allow. I am frugal by nature from growing up with a mother who had to coupon to afford groceries, so for me to spend this kind of money on a kitchen appliance was very, VERY hard. But, my husband talked me into, and I shopped around to get the best deal possible on it. It was so worth it! I use this more than any other appliance in my kitchen. I use it to make bread, desserts, cookies, whipped cream, and for grinding venison. It is a must have for a person who wants to cook from scratch while using a tool of modern convenience. I bought this immersion blender at a garage sale for $5. It was brand new and still in the box. I texted my friend, Susie Homesteader, and asked her if she thought I needed one and how useful it would be? She said to absolutely buy it, so I did. I use this thing ALL the time. I use it to make bullet proof coffee, blend up my canning tomatoes, to cream soups, and much more. In my opinion, cast iron cookware is a must. I have spent countless dollars on nonstick pans only to replace them year after year when they became scratched. Getting my husband to warm up to the cast iron has taken awhile, but now that's all we use. We do have one nonstick pan that he uses occasionally, but in my stubbornness, I refuse to use it. It's kind of neat to think about my great grandchildren using my pans someday! How can you be a homesteader if you don't put up your own food? Even if you don't have room to have a garden, you can take advantage of the local farmers' market and preserve foods that you and your family can eat all year long. I highly recommend having both a pressure canner and hot water bath canner. Do I even need to explain why you need these? After all, they are a homesteader's signature. Plus, you can't have a canner and not have mason jars. Mason jars can be used for more than canning. I use them to store homemade body cream, toothpaste, and deodorant. I also use them as flower vases, for spices, and to decorate my home. You may find good deals on mason jars by searching your local Craigslist or going to auctions and garage sales. Don't forget to get this resource with your canner and mason jars. Making a choice to homestead is like choosing to have an education in all things DIY. 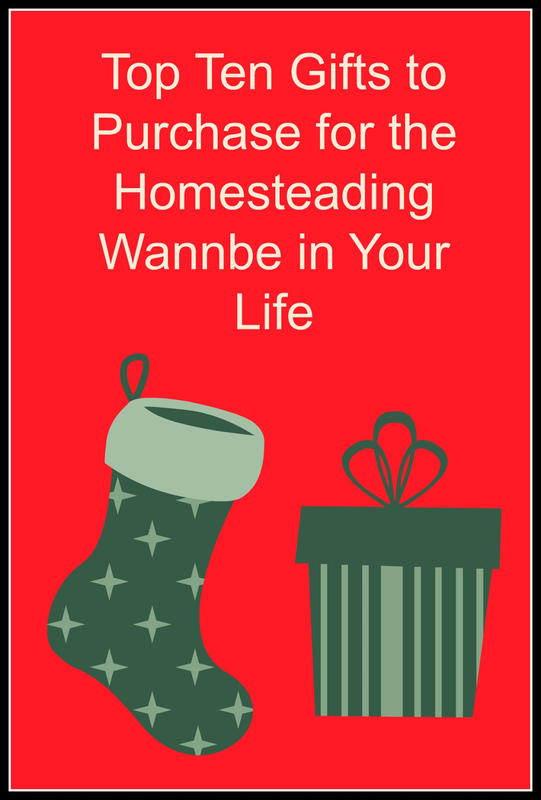 In order to be able to learn how to do homesteading projects around the homestead, you must have resources. Here are a few books I have, and some I recommend you adding to your collection as I plan to in the future. This was another one of those items that I had a hard time spending money on, but I'm absolutely glad I did. I use this food processor all the time during canning season to make my squash relish (which is a big hit around here with my friends.) I also use it to chop nuts, shred cabbage, and many other things. I also have six church cookbooks I have collected over the years, which tend to be the best ones out there, if you ask me. I have this stock pot and I use it for cooking broth, heating my canning produce, and making large batches of soup, chili, and more. One of my personal goals this year is to replace dryer sheets with wool dryer balls. I have just recently stopped buying fabric softener, which was really hard for me because I love the smell of it on my clothes. I plan to use my essential oils to scent my clothing by putting some on the wool dryer balls. There are lots more things I want to add to my homesteading kitchen like a grain mill and a professional meat grinder. For now, I will use what I have, and as the budget allows, I will keep adding to my collection. Being a homesteader doesn't require a milk cow, goats, sheep, pigs, or chickens...although they sure are nice to dream about. Homesteading is a state of mind! You do what you can with what you have. You use your resources and time efficiently to make the most out of both. You decide that instead of buying your food products, you are going to try and make them yourself just like your grandma did. If you never have a farm, land or animals, you can still do a lot of self-sufficient stuff and, yes, you absolutely can call yourself a homesteader! So go and get those books from the library, mama (or papa) and start doing what you can where you're at! 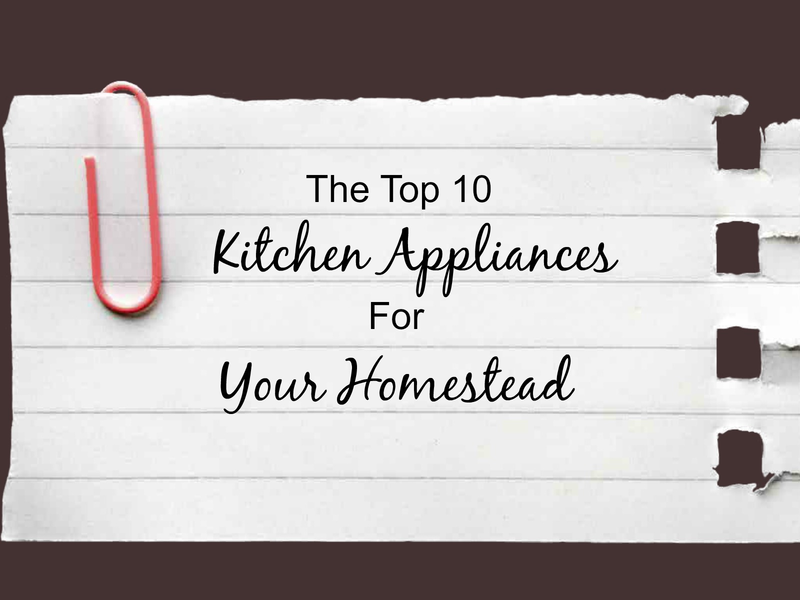 I encourage you to save and share this post for future reference as you build up your kitchen appliances for your homestead. I need to look more into wool dryer balls. Do they help with static? I don't worry all that much about scent or softness, but the dry air around here has me fighting static with every load. Yes, they are designed to specifically help with the static.